So, do you use VMware but don’t know how to guarantee the data safety, allow the virtual machines migration, enable continuous application availability, and eliminate any single point of failure within IT environment? Consider a combination of VMware infrastructure and StarWind VSAN for vSphere. VMware HA provides VMs with redundancy, while StarWind is responsible for the storage uptime. 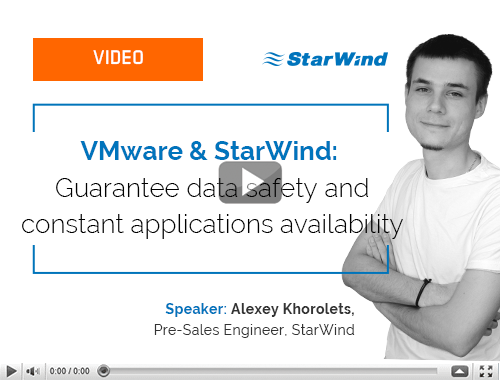 The combination of StarWind shared storage and VMware infrastructure ensures high application and data availability across the entire virtualized environment. Using StarWind VSAN, the local storage of both ESXi hosts is converted into a fault tolerant shared storage synchronously “mirrored” between the nodes. VSAN pre-installed inside a VM and running on both ESXi hosts ensures data safety and maintains continuous application availability. Learn from this video how to configure HA and FT VMware environment.